Christian Fish Flashlight Key Tags Pesonalized in Bulk. Inexpensive, Promotional. Budget Prices in USA and Canada. 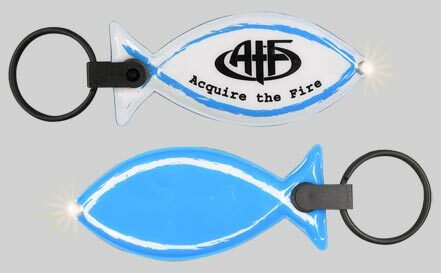 Bulk Christian Fish Key Ring Flashlight, custom imprinted with your logo or message. We also supply wholesale blank (not imprinted) Christian Fish Key Ring Lights: contact us for pricing. Budget Prices in the USA and Canada for bulk Christian Fish Key Lights . American clients pay no taxes. We will send you a proof for your approval before production. Prices include your 10 imprint colors on 2 sides! No Setup Charge. Typical Production Time : 25-30 days after artwork approval (import item). Truly distinctive, Flexi-Soft Key Lights are made with soft-foam padding, allowing the item to flex, covered with durable PVC, decorated in vibrant colors and powered by an LED/Lithium lighting system. Screen print up to 10 spot colors on both sides included inprice! Import item.